Saturday, Dec. 13, 2014 – 7:00 p.m. to 10:00 p.m.
Ease into the holidays with a festive event at Eubie Blake National Jazz Institute and Cultural Center Saturday, December 13 from 7:00 p.m. until 10:00 p.m. The pairing of great jazz and seasonal songs with delicious food and drink will make the winter sparkle and glow. Having performed their wildly popular holiday shows in other cities for several years, the Eric Byrd Trio will bring that music to Baltimore. Flutist Delandria Mills and saxophonist Jeff Antoniuk will join them in delivering jazz renditions of holiday favorites. Named by Urbanite Magazine as one of 10 “Movers and Shakers” in the Baltimore area, pianist/vocalist Eric Byrd has been playing professionally for 30 years. Byrd has performed with the likes of Wynton Marsalis, Mike Stern, Randy Brecker, Warren Wolf, and Yolanda Adams. Along with his recordings as a leader, he appears on a dozen more as a guest artist. He is in-demand as both a jazz and gospel performer. A Washington Post concert review notes the “rousing gospel-tinged chords and trilling blues runs” that, along with swing and bebop, are expressive features of his style. His trio includes Bhagwan Khalsa on bass and Alphonso Young, Jr. on drums. Award-winning flutist Delandria Mills adds magic to the evening with her unique combination of jazz, classical, and gospel styles. From 2003 to 2008, she toured with gospel singer, songwriter, and keyboardist Tye Tribbett. In 2011 she toured with her legendary mentor, flutist Hubert Laws and in 2012 with tenor saxophonist Billy Harper. The Texas native is a graduate of Peabody School of Music and a busy educator. Mills has performed with some of Baltimore’s best contemporary artists including Warren Wolf, Todd Marcus and Irene Jalenti. Saxophonist Jeff Antoniuk, regarded as one of the region’s leading artist/educators, brings his ebullient spirit to the mix. He has toured many of the world’s continents and shared the stage with blues and pop stars such as Ray Charles, Natalie Cole and Bobby McFerrin. Best known for his jazz chops, Antoniuk has appeared with Marcus Miller, Mike Pope, Amy Shook and Najee and fellow Canadians David Foster, Ralph Bowen and Ingrid Jensen. A degree in jazz performance and West African ethnomusicology from University of North Texas prepared him to work with Latin jazz performers such as Zaccai Curtis and Cesar Orozco and Brazilians Alejandro and Leonardo Lucini, and he appears on numerous high charting albums.The holiday show features music from the Eric Byrd Trio’s popular holiday album, A Charlie Brown Christmas (Foxhaven Records, 2009), including “O Tannenbaum,” “Skating,” and “My Little Drum,” and from Delandria Mills holiday album, Home for the Holidays (Ephphatha Queen, 2011), including “A Child is Born,” “Silver Bells and” “De Tierra Lejana Venimos.” The audience will enjoy swinging renditions of tunes like “Winter Wonderland,” and “Baby, It's Cold Outside.” The concert will be held at the Eubie Blake Center at 847 North Howard Street. Part of the thriving Mount Vernon Cultural District, the center is located near the Baltimore School for the Arts and Arena Players. The concert is sponsored by Jazz Beyond Borders and Eubie Blake. Light fare, wine, beer and other beverages will be available for purchase. 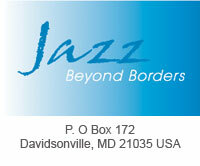 Baltimore Jazz Alliance (BJA) will host a Meet and Greet reception beginning at 6:00 p.m. and provide holiday cookies. Tickets are $25 in advance, $30 at the door and $15 for students with I.D. Tickets are available from InstantSeats.com (key words Eubie Blake) and in person. A sellout is anticipated, so advance purchase is highly recommended. There is plenty of free parking at 821 Eutaw Street at the University of Maryland Hospital Midtown Campus. Call 410-225-3130 for more information. For over four decades, the Eubie Blake Center has brought creative expression and urban consciousness to Baltimore through visual and performing arts education and opportunities for children, youth and adults in the community. The Center is named for James Hubert (Eubie) Blake (1887-1983), an African-American composer, lyricist and pianist of ragtime, jazz, and popular music. He was born and raised in Baltimore and spent much of his performing career there.